In actual fact, despite having two DSLR’s I only have one compact camera and that is the very desirable Panasonic LX3 about which I have blogged before. It really is a great camera with a great lens. The trouble is I have discovered that it is an awkward size. It is ideal for going for a walk with it over your shoulder, or even in a large coat pocket; it would never fit in an inside jacket pocket or even a shirt pocket. This means I can’t really use it as a compact in the true sense and so I needed just that, a compact. I have no great faith in tiny compacts to take great pictures as they have tiny sensors and often overambitious lenses full of compromises. They can never deliver control over DOF due again to their pinkienail sized sensors, but a compromise had to be made. I wanted small, simple, decent lens quality and reasonably fast response, (I once had a Nikon S210 and it was too slow to respond to the shutter button for my taste). The compromise I settled on was the Canon Ixus 100. I really wanted a wider angle lens, but most reviews said the obvious rival, the Panasonic fx40 delivered softer pictures due to an overambitious wide lens. So, I’ll only occasionally use my compact, but it’ll be great to have one small enough to be with me at all times. A good compromise I think. 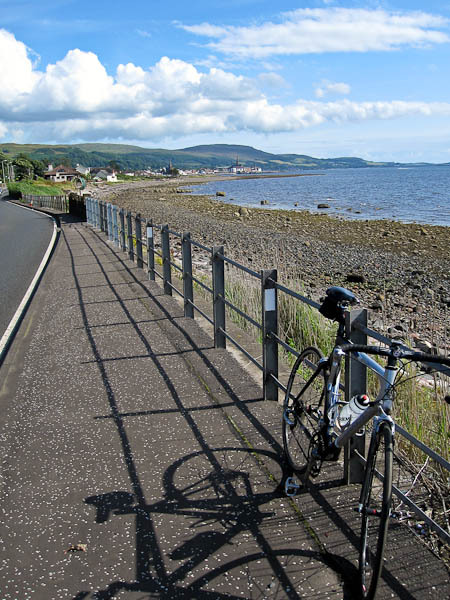 Yesterday was a case in point, I cycled to Largs and the Clyde coast, travelling light with just a cycle jersey and its back pockets for my raincape, phone and wallet. The ixus was so small as to be barely noticed in a corner of one of these pockets. Just for fun, here’s what it can do. “better than a slap across the back of the knees with a wet Glasgow Herald” as a friend of mine was fond of saying. My beloved Carbon Trek that uncomplainingly carries my 1/10th of a ton around. (no really!) Largs behind. 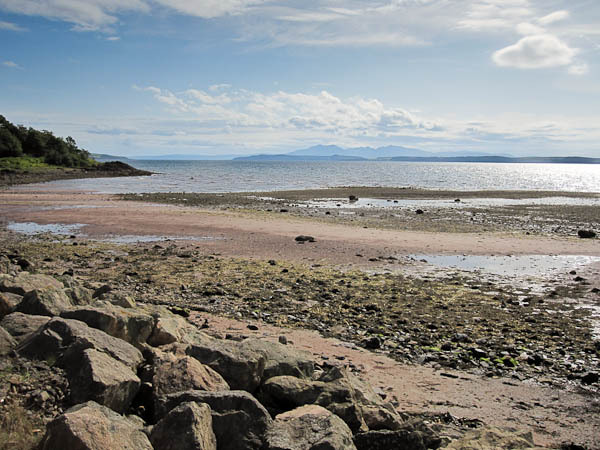 The beach near Skelmorlie looking back downriver towards Arran again. The UK can have no more beautiful river estuary than the Clyde. I absolutely agree! I recently bought my brother’s Minolta X-700 with bag and two lenses for when I get around to taking film shots, and I have just bought a refurbished Canon Powershot for exactly the same reasons as you…I’m reluctant to take shots inside some places with my DSLR and also a pocket sized camera is so handy for not missing THE shot! My first exhibition went well, lots of compliments but no actual sales except for some cards I printed myself of some of my photos. I have another exhibition at my village fete (La Cellette, Creuse, France) on the French national holiday on 15th August. I am buying a Canon Pixma i4600 printer this afternoon to print out more , better quality, cards!! I’ll post some shots I took of my exhibition stand in my Flickr ‘stream! 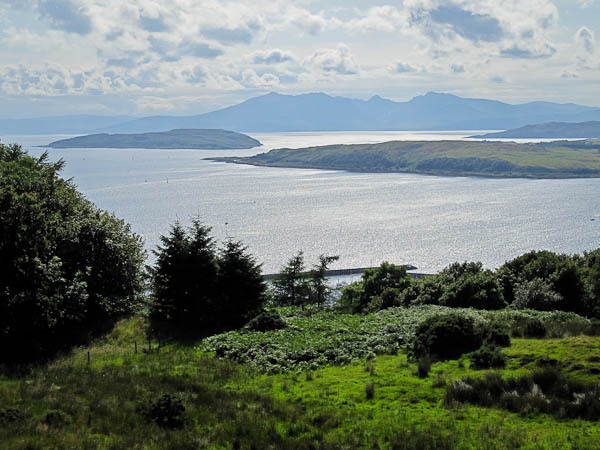 Love the shot of the estuary…my Uncle lives on Bute – wonderful scenery! Indeed, Matthew! One can never have enough equipment! My wife recently asked me if I had everything I needed/wanted and, of course, I said, “No!” …though I was satisfied for a bit. (Must admit I have still only used the Canon 70-200mm, f/4 lens a few times since I bought it last spring, but of course, I can’t tell her that! ). I, too, recently purchased a nice point & shoot for the same reason as you, Matthew. I got the Canon /SD 1100 IS and love it. Bad noise at high ISO (1600) and low light, but otherwise it is easy to carry around and saved me at the end of my trip to Germany when all my cards were filled! Thanks for giving your ideas. I’d also like to express that video games have been actually evolving. Technology advances and improvements have served create realistic and active games. These kinds of entertainment video games were not as sensible when the actual concept was being tried. Just like other kinds of technological know-how, video games as well have had to grow by many decades. This itself is testimony on the fast development of video games.